The third of four Atlantic coupes built by Jean Bugatti, this one is famously known for having been hit by a train at a railroad crossing in the French countryside in 1955. Much has been written regarding this car's authenticity, and it is true that not every panel is original. Yet before that tragedy this car had experienced a storied and historically important life. Many a race car has been saved from the scrap heap because it had a unique provenance. This car was worth preserving for its unique beauty alone, as well as for the same reasons that any unique historical object is saved: to continue its history, to honor the craft of the original builders, and to illustrate it's story to those who may not already know it. This car is uniquely different from the other Atlantics as it had been restyled soon after it was built. The evidence indicates that the styling changes had been commissioned by the car's original owners and completed by renowned coachbuilder Joseph Figoni, who had his own singular ideas about flowing surfaces and shape. The first owners, Jacques and Yvonne Holtzschuch, took delivery of 57473 in 1936. In the earliest known photograph of the car, taken at the Concours d'Elegance de Juan les Pins in 1937, the body was black with a light beige pigskin interior. In the next known photograph, taken in 1951 at the Circuit International de Vitesse de Nice, the body and interior had been significantly restyled. In order to participate in the race, the body had also been repainted blue in accordance with the Code Sportif International de la F.I.A. After changing hands several times, the car was eventually purchased in 1952 by René Chatard, who had it repainted gray near the end of 1954. Chatard and a female companion were driving near Gien, France when they were struck and killed by a train on August 22, 1955. Paul-André Berson recovered the remains in 1965, and started a decade-long project to rebuild the car. In the restoration he chose to work with the intact right-hand coachwork, and replaced the damaged parts. Upon completion in 1977, he sold the car to collector Nicholas Seydoux, who later had it restored again by André Lecoq. In 2006 the current owner purchased the car from Seydoux, and the unused dashboard, trim pieces, engine block, mechanical parts and original damaged body panels from Berson. We were commissioned to take the car back to its Figoni configuration: precisely true in every detail of line and color, as the car existed before the accident. 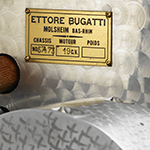 Extensive research was necessary, utilizing the excellent period photographs from the Bugatti Trust and the Pierre-Yves Laugier collection, the evidence obtained from the original parts and panels, and consultation with French automotive authority Christian Huet. The whole process was inspired by a very enthusiastic and involved owner, who studied the photographs and offered his own insights and sketches on many authenticity details. One of the significant style differences is in the configuration of the door windows, which were converted by Figoni to a wind-up operation. This feature necessitated a change to the depth of the doors. The re-installation of the original instrument cluster was defined by the discovery of the dashboard's original leatherette covering. The seat construction, door panels, interior window trim, and teardrop rear fenders illustrate Figoni & Falaschi's visual stylings. While most of the attention has been on the visual beauty of this car, we also gave the appropriate attention to the chassis underneath. The entire drive-train: engine, transmission, brakes, suspension, and wheels, was rebuilt to period specifications, using the original parts when available. The success of the project was displayed by the smile on the owner's face as he participated in the 2010 Pebble Beach Tour d'Elegance. The car was then on display at the Pebble Beach Concours d'Elegance, the perfect environment for the world to rediscover this very special car.